Implementing an email archiving solution is a way to ensure that your company emails are going to be there when you need them. This means that your archiving solution needs to be reliable and fast. It can’t be susceptible to data corruption, hardware failure or power outages. It needs to be as powerful, fast and reliable as a server, which runs non-stop and handles massive amounts of data. This is why, when choosing an archiving solution, you should look for an appliance with server grade hardware which, unlike consumer hardware, is built to endure uninterrupted use and the heavy workload of enterprises. 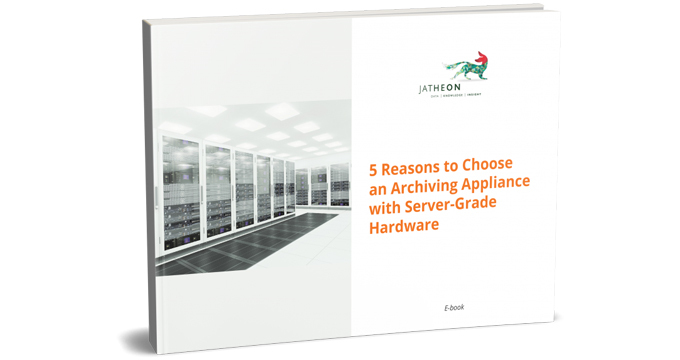 the five reasons you should choose an archiving appliance with server hardware ‒ a server grade chipset, ECC RAM, SAS hard drives, a RAID array and a redundant power supply.